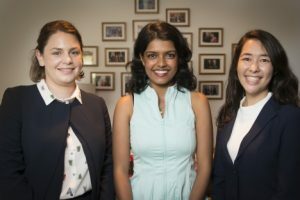 Law careers are one step closer for three Griffith Law School graduates who have been awarded positions with a prestigious Brisbane law firm’s graduate program. Sam Nean, Emi Christensen and Naomi Midha will take up the two-year program with Norton Rose Fulbright at the end of March. 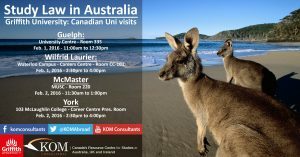 Next week we will be joined with Law School reps from Australia’s Griffith University at four different University Campus visits. Feb 1. we will be at Guelph University and Wilfrid Laurier University and Feb.2 we will be at McMaster University and York University. Next week we will be joined with Law School reps from Australia’s Griffith University at four different University Campus visits. February 1st we will be at Guelph University and Wilfrid Laurier University and February 2nd we will be at McMaster University and York University.